One of my favourite parts of maths to teach, great for letting pupils investigate and discover circle theorems for themselves. 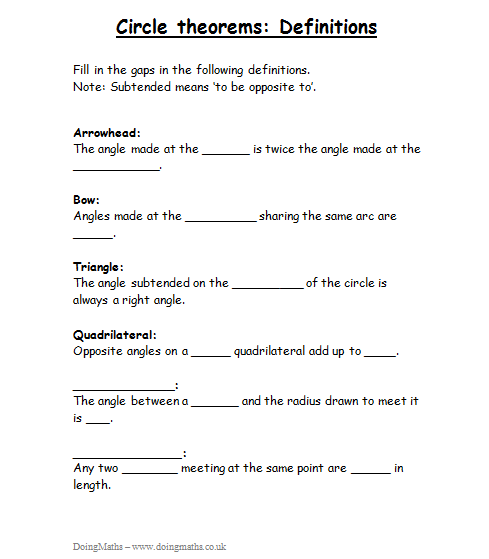 A worksheet for pupils to measure angles and investigate three of the circle theorems. This worksheet contains circle theorem questions with the answers partly done to guide the pupils. They need to fill in the gaps and state which theorem they have used. 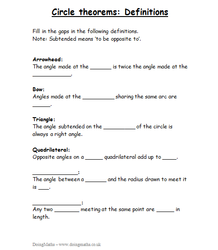 A worksheet for pupils to measure angles and think about what the tangent theorems could be. A worksheet for pupils to fill in the missing words in a list of circle theorem definitions.